Though we can’t be sure that it’s a promotion for a new movie, as opposed to a video game, some action figures or maybe even comic books, there’s an official teaser out there for something new and Predator-shaped at Comic-Con. Here’s the image, as posted to the official Predators Facebook page. As pointed out to me by Middle Easy, this is a map of San Diego with the marina area towards the bottom. Con central. I can imagine a new Predators film being a real possibility, but can’t work out quite where on the Comic-Con schedule the announcement might be hidden. My hunch is that this will be a film – the Predators Facebook page belongs to 20th Century Fox, a film company after all – but we’ll have to wait and see. Fox have promised a big surprise for their panel… but isn’t that most likely to be the new X-Men movies? 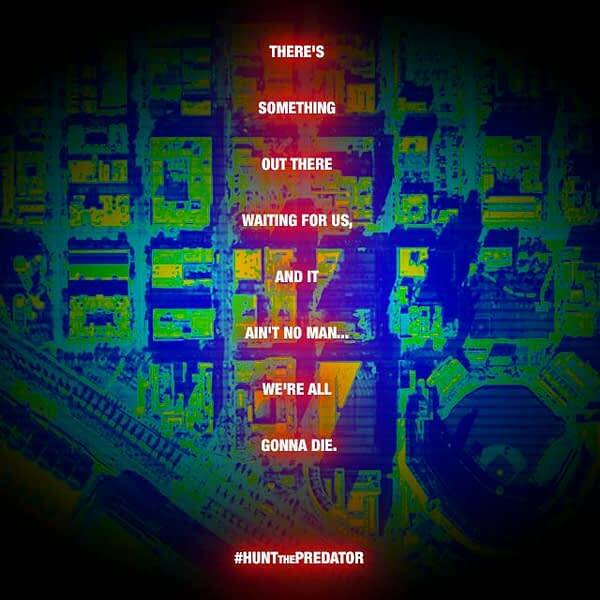 I expect our next clues will arrive via Twitter and the #HuntThePredator hashtag. I’ll keep my eyes peeled and my infrared visor set to full power. UPDATE: And I just remembered something. I already reported on there being a new, 3D version of the first Predator film coming to Blu-ray soon. My current hunch is that this will be what the promo is for – likely in a collectable Predator head case of the like. UPDATED: Fox have now confirmed that this promotion is for the Blu-ray 3D release of the film. They’ll be selling pre-orders of a collectors editions at Comic Con. I guessed correctly! So, Who Is This Craig Skinner Chap Anyway?